Nikon’s Coolpix range has proved extremely popular with both amateurs and professionals with the ability to capture images easily with a stylish and compact camera. The new Coolpix L10 and Coolpix L11 are the latest additions to this range, combining a range of features that justify Nikon’s reputation as the pioneer of state-of-the-art camera technology. Within the stylish and compact bodies of these new models, Nikon has packed in a range of exciting features to achieve optimum results in a variety of challenging conditions. 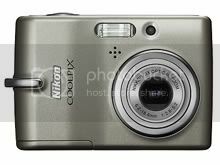 The Coolpix L10 and the Coolpix L11 guarantee image quality with resolutions of 6.0 and 5.0 megapixels relatively, as well as light sensitivity of up to ISO 800 which makes it possible to produce quality shots in low light conditions without using lower exposure. These features also ensure that the user is able to capture fast-moving objects without blurring or loss of detail. Ample LCD screens of 2.0-inch on the Coolpix 10 and 2.4-inch screen on the Coolpix L11 allow the user to view their results immediately with friends gathered around. Nikon’s exclusive PictureProject software also makes it easy to edit, organise, transfer and share the images taken with these new cameras. Unlike many compact digital cameras on the market the Coolpix L11 and the Coolpix L10 are compatible with AA-size batteries. Thanks to this advantage, users never have to worry about recharging their batteries or running out of power at an unfortunate moment. They can simply pick up a new set of batteries no matter where they are in the world and keep on shooting without worry. With the Coolpix L11 and L10, the high quality of the images is complemented by superior body design. Slim and compact, they fit comfortably in the hand to promote natural, yet steady shooting, while the lens retracts when not in use to make both cameras even more compact for carrying. What’s more, they are also available in a range of attractive colours.